Minister of Finance, Kemi Adeosun, defence, Mansur Dan-Ali and the governor of the CBN, Mr. Godwin Emefiele are expected to appear before the relevant committees for questioning latest next week. Senator Sam Anyanwu (PDP, Imo) had said in a motion that the money was withdrawn from the federation account without National Assembly approval. He said: "In March, 2018, from the Federation Account $462m was withdrawn by the Federal Government. It was paid to an American firm for the purchase of helicopters. "This was done without an approval from this Senate and from the National Assembly. I know that there was no time any request was brought here for the approval of such an amount by the Federal Government. "I will request that we invite the CBN governor, the Ministers of Defence and Finance. They need to tell us how these monies were withdrawn and paid to this American firm without the approval of the Senate," he said. Efforts to get further details on the allegation from Senator Anyanwu yielded no result last night. The Senate resolved to summon the trio as suggested by Senator Anyanwu to throw more light on the alleged withdrawal. In his remark, Deputy Senate President, Ike Ekeweremadu who presided over the plenary, said the two ministers and Emefiele should appear before the Senate committee on Appropriation. The appropriation committee, chaired by Senator Danjuma Goje (APC,Gombe), was given a week to probe the matter. The matter also came up at the House of Representatives which asked the relevant committees to verify the withdrawal from the federation account for the procurement of military hardware. Toby Okechukwu brought up the matter while contributing to a motion calling on the federal government to ensure the safe rescue of the Chibok girls and the remaining Dapchi girl. He said the alleged withdrawal of the amount and the procurement of the military hardware was illegal. He said the amount was equivalent to N165bn, and that it did not include the $1bn reportedly approved by President Muhammadu Buhari for military expenditure. "It seems our power of appropriation has been taken over by the Executive Arm, and we can't sit here and continue to watch things going the wrong way," he said. Commenting on the matter, Speaker Yakubu Dogara said if it is true that such an amount was withdrawn from the federation account, "it is a grievous offence. "If it's true that moneys were taken away from the federation account without explicit approval of the National Assembly, then it can be regarded as outright stealing, I'm sure the United States, which is the bastion of the democracy we're practising can't accept stolen fund," he said. Dogara referred the matter to the committees on ethics and privileges to ascertain the veracity of the withdrawn and get back to the House before any action could be taken. The speaker said what the two committees would do is not an investigation but to verify the allegation. Daily Trust reports that the 'helicopters' may be 12 Super Tucano A-29 planes and other weapons worth $593m approved for Nigeria by the United States of America. The US ambassador to Nigeria had presented the letters of offer and acceptance to the Nigerian Air Force, adding that the U.S. State Department had approved the sale and final agreements to be signed and necessary payments made before February 20. The Super Tucano planes, which are propeller-driven with reconnaissance, surveillance and attack capabilities, are made by Brazil's Embraer, with a second production line is in Florida, in a partnership between Embraer and privately held Sierra Nevada Corp of Sparks, Nevada, USA. The plane costs more than $10 million each and the price can rise depending on the configuration. When contacted at the time over the cost of the A29 Super Tucano Fighter jets, the spokesman of the Nigerian Air Force Air Vice Marshal Olatokunbo Adesanya said he would reveal details of the full cost at the right time. He however said that apart from the purchase of the aircraft, details of the transaction would include spares for the jets, training of pilots, training of maintenance crew and ammunitions. 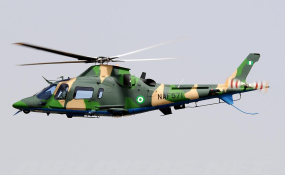 A defence contractor told Daily Trust that the helicopters in question may be for the Nigeria Air force and some of them were ordered for since two years ago. The source said depending on the specifications ordered for; such helicopters may cost between $18m to $30m a piece. He said that it is likely that the helicopters will be the Russian made MI35 or MI24 as such helicopters can be configured as gunships or troop carriers. The source said he is aware that the Nigeria Air Force was asked to go into direct negotiation with the Russian agency responsible for arms sales abroad. Such deals are usually through agents on both sides with commissions worked into the purchase. The Nigerian Air Force (NAF) said on October. 23 that it had commenced Operation "RUWAN WUTA II," as part of efforts to further decimate the remnant activities of the insurgents in the country. The Director of Public Relations and Information, NAF Headquarters, Air Commodore Olatokunbo Adesanya, said in a statement then that the operation was essentially an intensive day and night aerial bombardment designed to rain significant fire on freshly discovered hideouts of the insurgents. "On the first day of the operation, NAF conducted several Air Interdiction missions in the North-East, including one on a location in Garin Maloma. "Previous intelligence reports, gathered through Intelligence, Surveillance and Reconnaissance (ISR) missions by NAF ISR platforms had revealed the presence of a large number of insurgents in some dispersed structures in Garin Maloma. "Consequently, the location was attacked, in succession, by two Alpha Jet aircraft," he said.